As the end of the school year draws near & christmas gets closer everyone gets busier & busier & our family is no exception. 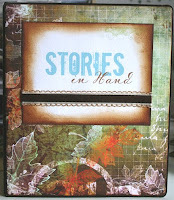 But I did find time to participate in an online class called "Stories in Hand" by Jessica Sprague. One of the first things we had to do in class was create a binder to store our notes & whilst she supplied some downloadable paper & other stuff to simply stick on a specific pre-bought binder, I (of course LOL) had to be different ;) . 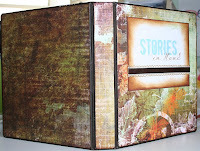 The original binder was supposed to be 6"x6" but I bought a 7"x9" one & decorated it myself. All of the internal pages also had to be altered & I am still working on some of those, but here are the pics of the outside anyway. Its just a plastic folder, so I gessoed it, then painted it & attached the paper I chose (Bo Bunny Beautiful Life) & put on the ribbon & title etc. It looks really lovely & Im very happy with the way it turned out.